Okay, so the carnation isn't pink, but the majority of my card is. I still had material out in my studio from the Play Date Cafe Color Challenge, instead of putting them away, I created another card using this weeks colors. Why not grab some stamps and card stock and play along, you have until Tuesday to get your entry in! I used the Pleated Paper Technique to use of the scraps of the DSP. 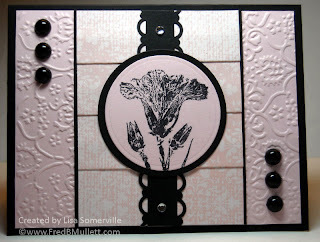 The Pink panel is embossed with the Damask Cuttlebug Folder. 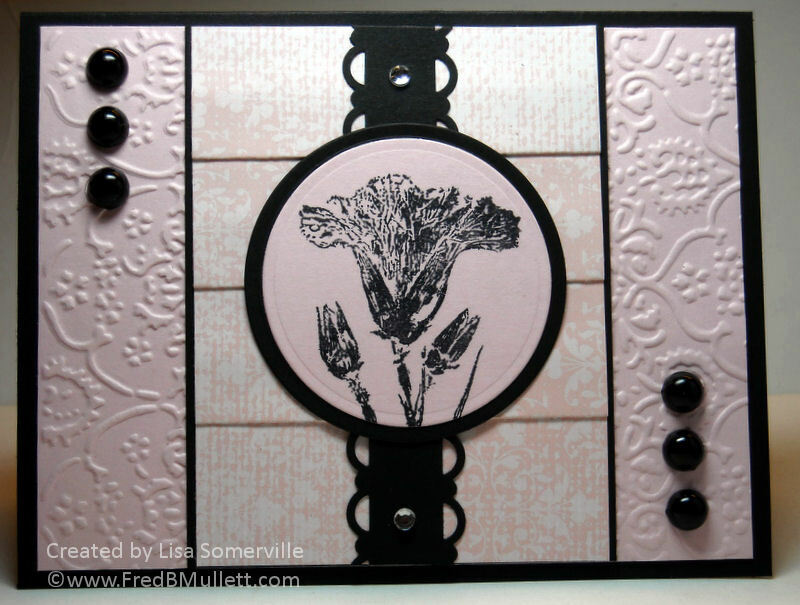 The beautiful flower image is from Fred B. Mullett (item FBM_365), stamped in Black Archival on Pink card stock, then cut with Spellbinders Circle Dies. Thanks for stopping by, I hope you all have a wonderful Mother's Day! wow very pretty! i love his stamps! Love the colours, so soft and pretty, and the black brings the whole card to life. Great card, luv how you made the image eally pop! Very pretty, love that punch! Beautiful and elegant! Love the shimmer.